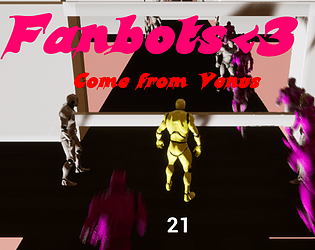 Your a famous bot on Venus, all the fanbots noticed you. RUUUN! Me looking at the theme and thinking. What would it feel like to be chased by a large crowd of adoring fans? Aka an aspiration most dream about but never get. Great job dude!! Can't wait to see what you come out with for the 72-Pin!! Great job on finishing the game and getting it submitted! You should focus a bit on optimization in my opinion, because the game takes up a lot of resources for a gamejam game. I think all those people chasing made the performance bad on my machine. Maybe state minimum requirements or don't have so many people chasing. LOL this game's pretty funny. It's not the most polished or complete, but seeing the crowd of fans just slam into you from behind is hilarious. I would've put in screaming sound effects, if I had the time. Great fun! Once you get the hang of it's actually not even that totally impossible or something. It still is however, this game will never be easy. Good job on finishing, even after the deadline. Thanks!